Kimberly Trowbridge is a painter who merges abstraction and figuration into allegorical images that narrate the passage of time with layers of paint. Her paintings are the stage where internal visions mingle with external form, enacting the stark yet tender drama of the human experience. The temporal reality of the human condition has become increasingly significant in my work. In my current paintings, the figures and the spaces they inhabit are allegories that represent the collective and fleeting aspects of identity. Many of my images depict bucolic scenes of a lost Golden Age, set in an idealized Arcadia. These nostalgic scenes signify art historical landscapes where classical figures frolicked before the existence of time. My figures carry the residue, or memory, of these past selves into their new forms. They integrate classically modeled body parts with fractured geometry, in order to depict a state of mutability and redefinition. 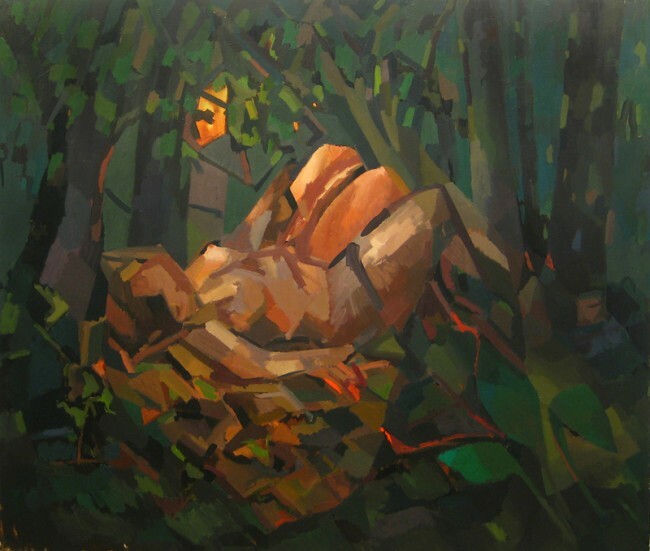 I am interested in the relationship between the figure and the environment and how they mutually define each other. 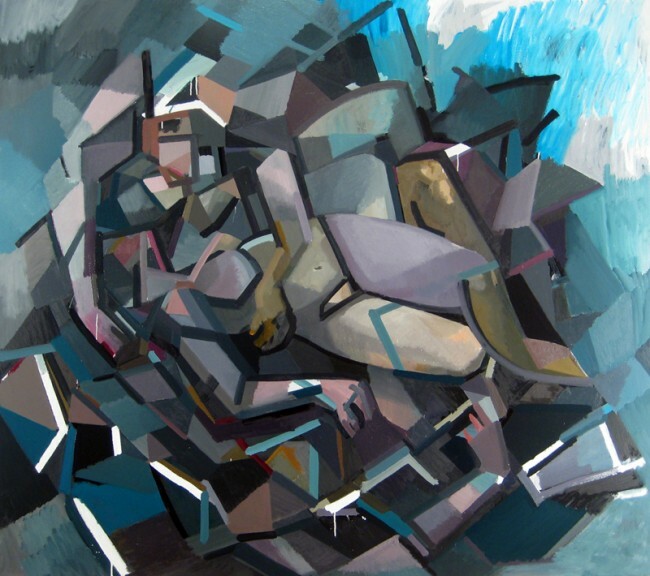 I start my paintings with an overall geometric structure that creates both the figures and the surrounding space. Within this structure I swap parts of the figures with the space, as well as interchange parts among multiple figures. 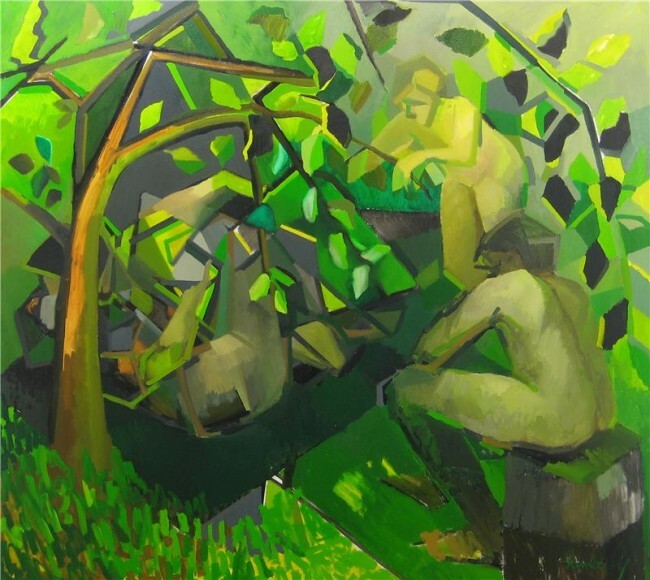 In recent works, including Plantlife and Jupiter, I use the image of lovers interacting to show the deconstruction of individual figures in the act of creating a new collective form. I aim to expose how, through mutual exchange, we rearticulate our understanding of reality— that identity is a constantly revised palimpsest of experience. Stunning!!! Every artist should subject themselves to nature’s biological functionality. So they can smell the decay of the forest in their pigments and feel the warmth of the sun in their structures. All the senses come alive when I look at your work.